By the mid 80’s the quartz revolution had successfully dominated the watch industry. This resulted in large numbers of watches being sold, but with the rapid technological developments the prices of watches fell very rapidly resulting in the perception that these were now commodity items. The high numbers of quartz watches also resulted in massive numbers of batteries being produced and disposed of each year. The environmental impact of these batteries was identified as an issue that would continue to grow so Seiko decided to develop a product that would not require continued battery replacement. 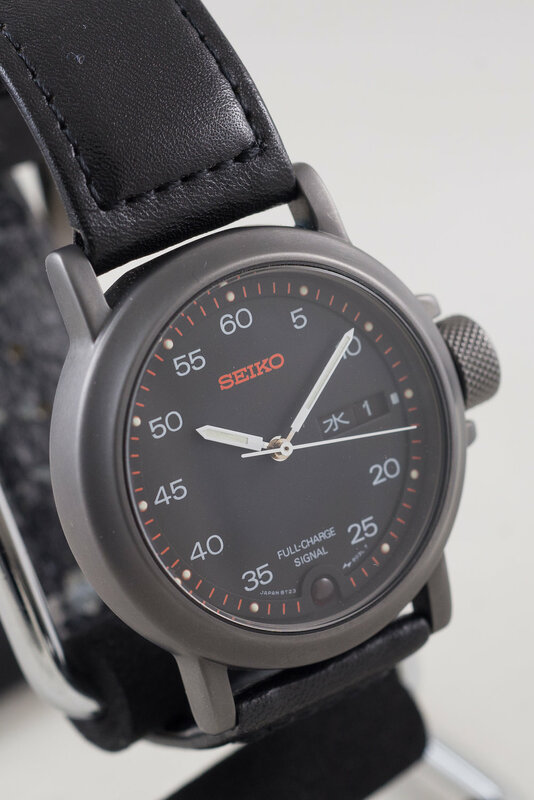 To meet this criteria Seiko Instruments Inc. (SII) developed the 8T23 caliber. This was the world’s first hand wound quartz watch. The wearer is able to wind the crown to turn a small electrical generator that charges a capacitor. The quartz movement is then able to be powered from the capacitor. As the capacitor is able to be recharged continually the watch does not need to have batteries replaced regularly. These watches were first released in late 1986 and there was two different models in the range. The model pictured here is the SBAD003 and the other model was the SBAD001. Both models sold for ¥28,000 and had a movement and case code of 8T23-8020. The SBAD003 model has a dial code of 8T23-8030 and the SBAD001 has the 8T23-8020 dial code. 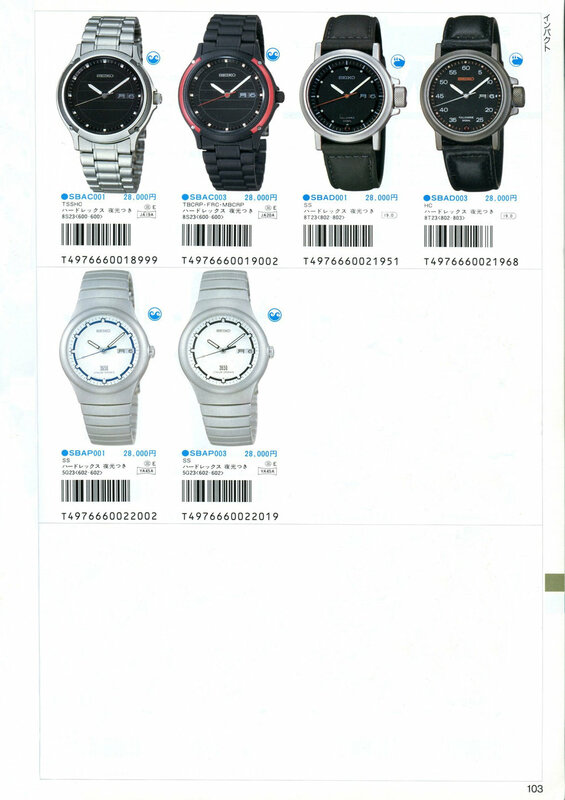 The two watches are pictured in the Seiko 1987 volume 2 JDM catalog in the section for watches under the Impact branding. To develop the movement a couple of key technological hurdles had to be overcome. Firstly a compact power generation system that could fit inside a watch needed to be created. Once it was decided that the watch would be powered by the user themselves by winding the watch it was fitted with a distinctive oversized crown that makes this regular operation easier. Unlike a mechanical watch the crown is able to generate power if wound clockwise or anti-clockwise as the generator will produce an AC signal. 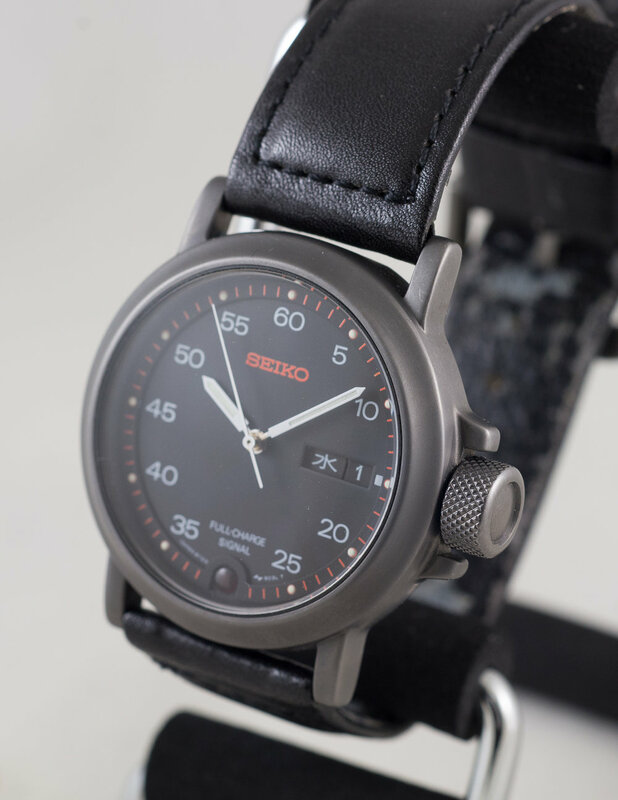 The designers specified the target of a three minute winding time to go from completely discharged to a full capacitor. Once the watch is fully charged the red LED at the 6 o’clock position is lit to indicate to the user that further winding is not required. 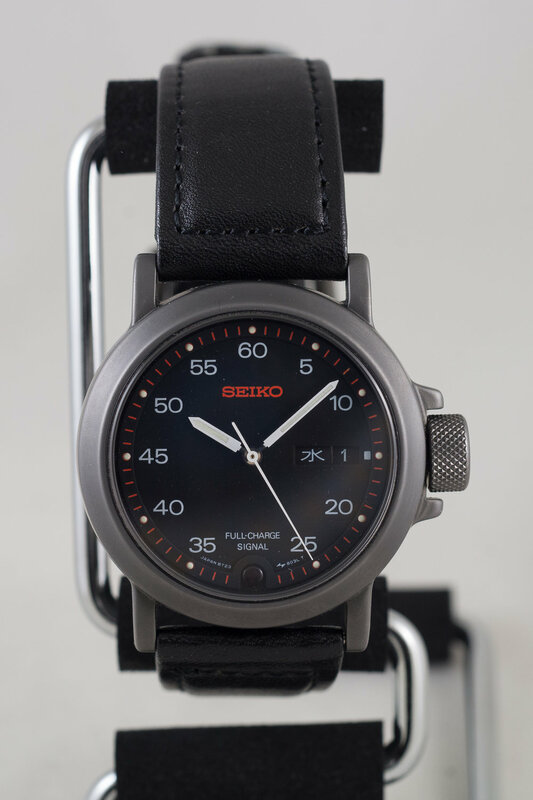 A full charge on the capacitor will provide approximately 75 hours power reserve. The capacitor can be seen in this movement shot with the two power generation coils and the stepper motor coil. When to watch begins to run low on power it will move the seconds hand in two second increments. If the user winds the watch and stops as soon as the second hand returns to normal operation the watch will have charge for approximately 30 hours of operation. In order for the crown winding action to be translated into power generation a small electrical generator needed to be developed. The power generation system is comprised of a pair of power generation coils and a twin pole magnet that is rotated via a yoke assembly. To turn the magnet at a high enough speed to generate a useful current the rotational speed of the crown goes through a gear train resulting in a speed increase of 300x. Consequently a crown rotational speed of 5 revolutions per second results in the magnet rotating at 1500 revolutions per second (90,000 RPM). You can see in the movement shot that there are a total of fifteen jewels used on the movement and that many of these are used for the power generation mechanism including the Diashock assembly located on the main pivot. 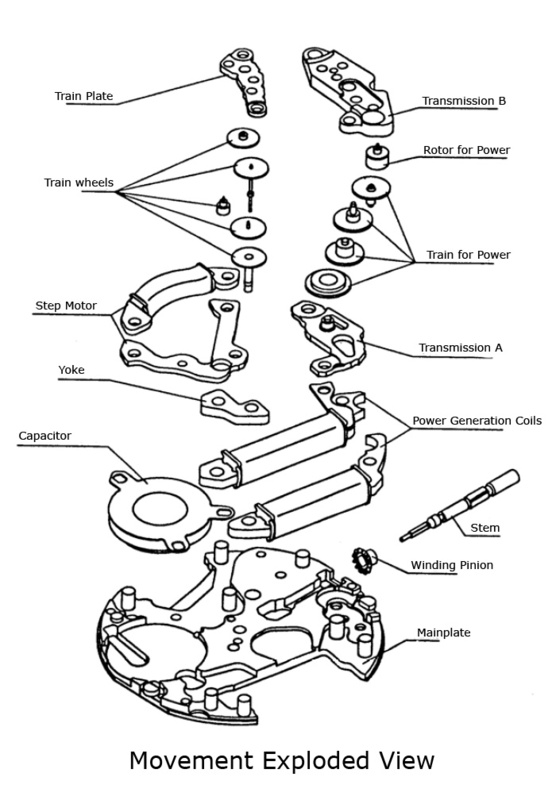 An exploded diagram showing the different components of the movement can be seen listed below. As you can see half the movement is like a traditional quartz watch while the other half is dedicated to the power generation. The following block diagram shows the general power generation and charging process for the 8T23. The thick arrows indicate the flow of energy and the thin arrows mark indicate the flow of control. When the crown is turned the rotational force is amplified via the power train and transmitted to the generator where AC power is created. The AC power is then rectified by a rectifier circuit to charge the capacitor. This capacitor is used as a power source to supply an IC that detects the voltage available and charging process. Once the capacitor has been full charged the overcharge prevention circuit is engaged and the charged LED is activated. The other major challenge facing the designers of the movement was developing a stepping motor that was able to operate over a wide range of voltages while maintaining a low power consumption. As the available power from the capacitor drops during operation the stepper motor is unable to be stably driven using a traditional motor controller design. In order to resolve this issue the IC measuring the capacitor voltage will alter the length of the stepper motor drive pulse in four different configurations to provide the required amount of torque. By altering the length of the pulse the adaptive control allows for a stable stepping motor control. 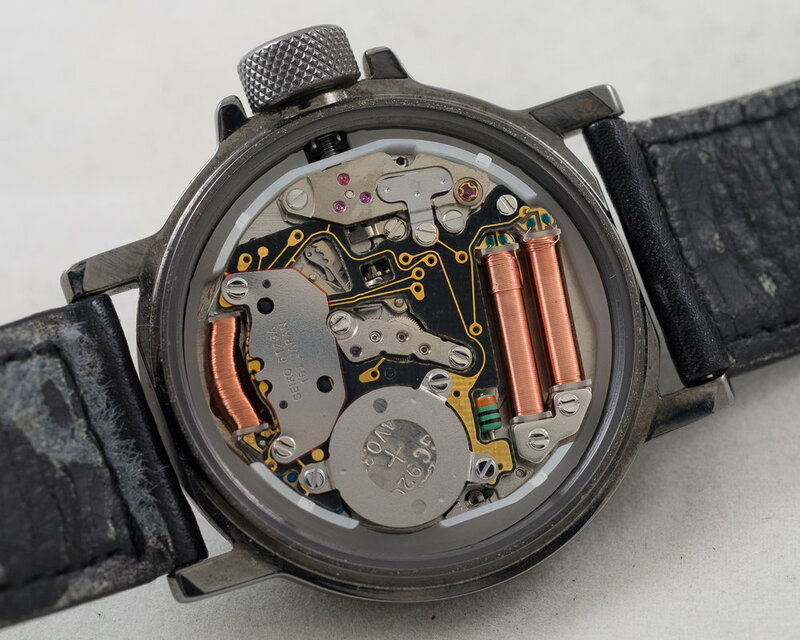 The 8T23 hand wound movement was only produced for a little over a year. I think that a three minute winding operation for a three day power reserve is not something that many customers would find acceptable. In the following year (1988) the Seiko Epson produced AGS (automatic generating system), later to be renamed Kinetic was released. As this design did not require winding and instead used a weighted rotor to move the generator in the same way as an automatic mechanism. The ability to hand wind a Kinetic movement was added with the introduction of the Kinetic Direct Drive technology almost twenty years later in 2007. While not commercially successful the 8T23 is an interesting movement and very likely the solitary hand wound only quartz model ever produced.